Welcome in our hotel Angerer and attached inn “zum Hirschen”. 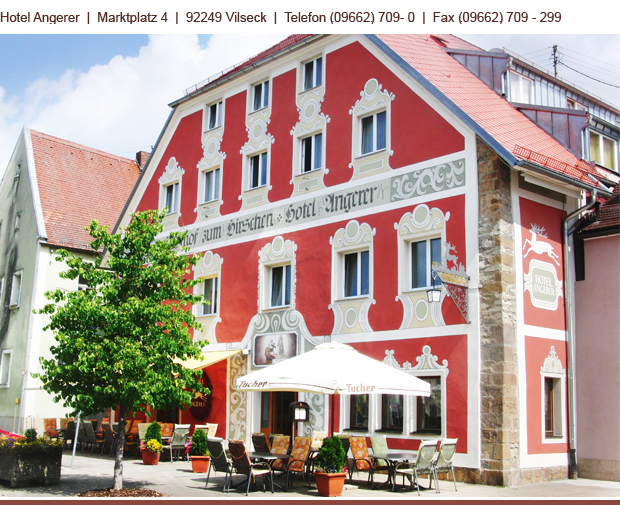 When the inn was built in 1557, it served as a tavern and a host for the nearby castle Dagestein. By takeover in our family property in the year 1666 the inn`s work is proudly carried on in the 14th generation. Be our guest in the Upper Palatinate and discover our region – rich of culture and sights, sports and leisure opportunities. This will expect you at our house. In this clip you will learn about our family-managed hotel with its endowments and take a look at our region. For arrivals outside opening hours, please contact the hotel in advance. Beautiful days should be celebrated at an impressive location with enough capacity. Weather 10 or 100 people, we can offer you and your people the neccesary rooms. Single-rooms, double-rooms or family-suites: We are able to accomodate all of them. Further more we can offer you special rates! An early check-in is possible. Of course your people can sleep long after the party. So you can start your day till 12.00 a.m.